Long before Dorothy drops in, two other girls meet in the Land of Oz. One - born with emerald-green skin - is smart, fiery and misunderstood. The other is beautiful, ambitious and very popular. WICKED tells the story of their remarkable odyssey, and how these two unlikely friends grow to become the Wicked Witch of the West and Glinda the Good. "...As a parable of fascism and freedom, "Wicked" so overplays its hand that it seriously dilutes its power to disturb. Much of the impact of Baum's original novel, like that of so many fantasy stories, came from haunting, symbolic figures that readers interpret on their own terms. Though there have been numerous literary analyses of Baum's "Oz" as a coded case for populism and agrarian reform, the book never feels like a tract. "Wicked," on the other hand, wears its political heart as if it were a slogan button. This is true not only of the dialogue, but also of Mr. Schwartz's generically impassioned songs, which have that to-the-barricades sound of the omninously underscored anthems of "Les Miserables." Though the talk is festooned with cutely mangled word ("swankified," "thrillified," "gratitution") that bring to mind the language of Smurfs, there's a rock-hard lecture beneath the preciousness. Mr. Mantello reconciles the gap between form and content only in Ms. Chenoweth's performance." "...Wicked," the "prequel" to "The Wizard of Oz," is an interminable show with no dramatic logic or emotional center. Constantly lurching in different directions, the show seems to believe that whenever you reach an artistic impasse, throw money at it - in this case, $14 million." "...Lavish, ambitious and problematic...Where "Wicked" shrinks and stalls for time is in its score by Stephen Schwartz... It's an odd mixture of ponderous pop anthems and more conventional musical-theater material that only occasionally rises to the level of the show's sterling cast." "...Described as a dense epic fantasy, 'Wicked," based on a novel, is an intricate work. 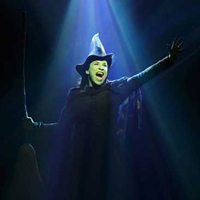 It tells the story of Elphaba, the bright but neglected young girl born with green skin who is good and kind. How she turns into the wicked witch is a long, winding road filled with bizarre characters and strange plot twists. The problem with the show's book, by Winnie Holzman, is that it has to cover so much ground in a connect-the-dots fashion that we're deprived of the necessary depth and character development to make us really care about Elphaba or her unlikely friend Galinda, who later becomes Glinda the good witch. Director Joe Mantello handles the intimate scenes well, but he's not quite as successful moving the traffic on Eugene Lee's dark, mechanical set. The ensemble numbers are indistinguishable. The special effects were impressive but a show of this caliber needed more. Stephen Schwartz, the composer behind "Godspell" and "Pippin," has written some lovely music, particularly his ballads for the witches, but the score is uneven and the beautiful melodies that marked his earlier works are disappointingly absent here." "...It's not easy being green. Or blonde, for that matter. Those are just two of the many lessons to be learned from this big, murky new Broadway musical. But maybe the most salient pointer is that it ain't easy being a Broadway musical. A strenuous effort to be all things to all people tends to weigh down this lumbering, overstuffed $14 million production. "Wicked" is stridently earnest one minute, self-mocking the next; a fantastical allegory about the perils of fascism in one scene, a Nickelodeon special about the importance of inner beauty in another. There are flying monkeys, flying witches and flying scenery, but the musical itself truly soars only on rare occasions, usually when one of its two marvelously talented leading ladies, Kristin Chenoweth and Idina Menzel, unleashes the kind of vocal magic that needs no supernatural or even technical assistance." "...It's too soon to tell whether Schwartz's score for Wicked, which opened Thursday at the Gershwin Theatre, will prove as enduring. But it's safe to say that this is the most complete, and completely satisfying, new musical I've come across in a long time. The triumph is not Schwartz's alone. Adapted from a Gregory Maguire novel, Wicked offers a post-feminist, socially conscious reinterpretation of the story of Oz's Wicked Witch of the West. Though that may sound like a recipe for pretentious pedantry, writer Winnie Holzman, whose TV credits include thirtysomething and My So-Called Life, provides a libretto that juggles winning irreverence with thoughtfulness and heart." "...What is spectacular about the show is the spectacle. That old Emerald City has never had it so good, with flying monkeys and giant Muchkins with extendable necks. Kids will love it, even if they don't quite understand it. But this yellow brick road is also paved with Steve Schwartz's oppressive music and banal, if sometimes pretentiously amusic, lyrics and the complex, if foolish, book by Winnie Holzman." "...Wicked is at its cleverest with the girl stuff; the streamlining of Maguire's story... weakens the narrative logic. Catchy Stephen Schwartz songs... compensate for a dreay opening number, but it's the Wicked witches who really make magic." "'Wicked' tries, in its ambition, to do so much that it's inevitable that it fails to be a smooth, cohesive show. It's too long - two-hours-45- minutes - and it often has a lumbering quality. But its reach, its attempt to be meaty and relevant and theatrical, is not only admirable, it�s stimulating. This is a musical that offers many pleasures as you watch it, and - this is rare - also stays with you." "...Wicked, which opened last night at the Gershwin Theatre, isn't perfect, but it's more than good enough to run for a decade or two. If it doesn't please you, you're too tough to please." "...Based on novelist Gregory Maguire's 1995 adult variation on the Wizard of Oz mythology, Wicked provides a prequel to the children's book and movie. The lavishly designed musical addresses complex themes, such as standards of beauty, individual morality and, believe it or not, opposing fascism. Thanks to Winnie Holzman's witty book and composer-lyricist Stephen Schwartz's robust and pop-inflected score, Wicked soars." "Two of the producers of the musical Wicked bear the name Platt, which (in German) means flat, and one the name Stone, which (in English) means heavy. Why not also one called Long, although it is too much to ask for one called Boring, all of which apply to the show." "Wicked, a hideous mess of a musical that wants to be many different things, and rarely succeeds in being any of them. All this from a creative team that, aesthetically speaking, seems barely able to walk and chew gum at the same time." "...The show and its many parts do coalesce to create a believable, and extremely thought-provoking, alternate universe with music, sets, costumes and performances that simply take your breath away." 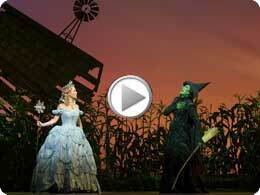 "No one mourns the wicked," goes one big number in the new Broadway musical Wicked. But in this shrewd and enjoyable retelling of the Wizard of Oz story from the witches' point of view, they get something better: understanding." "While the show suffers from a lack of a clearly defined identity, it does succeed in reaching out to all the different audiences targeted. It's real weak spot is the music." "The new musical at the Gershwin is a thoroughly mechanical and unmagical musical. It is the ultimate whitewashed example of how a musical written to pander can even fail at that when it has no centralized guiding force." "...The confident good humor of it all is remarkable. Wicked manages to be both quite cynical and very innocent simultaneously-- an impossible feat." "Perfect casting. Every production number is a fashion parade though each could have been more than that. There's a strong sense of excitement in the air all night long, and the socko song Defying Gravity, helps the first act curtain be so impressive." "This musical is full of glitz and is a big Broadway spectacular; it is also a charming story with a wonderfully catchy score. 'Wicked' is satisfying in a sparkly way, and also in a storytelling way...The popularity of 'Wicked' can be explained by the last minute or so of the first act. It is an incredibly successful merging of dramatic spectacle and character development - and is one of the few truly unforgettable moments I have seen in a Broadway musical." "...Extravagant in ambitions and looks, the rich, enthralling tuner whirled last night... delivering the sort of classic musical theater sensibilities and spectacle that make Broadway at its best such an unforgettable experience." "There have been moments in the history of musical theater when, like a twister, the sheer talent and whirling spectacle of a production have flattened any negative criticism that stood to get in its way...The latest incarnation of this impeccably oiled entertainment machine finds a new gear courtesy of a British import." "A marvel of organization and inventiveness. Lusciously composed, smartly written and beautifully staged, 'Wicked' is one of the rare shows in town that justifies a $100 ticket. The cost is easily paid back in memories alone." "To begin with, it looks like a million dollars - or, to be more precise, like every dime of the $14 million that has been spent on it. Dare we say it? Here's a Broadway show where the ticket price doesn't seem inflated. You will actually feel that you got $100 worth of entertainment - and then some... The show and its many parts do coalesce to create a believable, and extremely thought-provoking, alternate universe, with music, sets, costumes and performances that simply take your breath away." "Stephen Schwartz's songs are uneven, at best... The real trouble starts with "No Good Deed," which doesn't fully explain why Elphaba is committing herself to a life of wicked-witchiness. It's one of several troublesome plot leaps in the last few scenes of the show. But there's a backhanded compliment in the complaint. When was the last time you invested in the story of a new musical enough to be troubled by its plot leaps more than two and a half hours in?" "Great leads. Clever source material. Fans who turn the show into a religion, spending hundreds�thousands�of dollars on repeat visits." "I continually come across people who want to shame me for my abiding love for Wicked. Something this popular, they seem to say, can't possibly be good. I beg to disagree. Wicked is simultaneously an entertaining, well crafted, and intelligent show."